Because of the technical nature of the manufacturing process all suits are made to order. Please allow 3-4 weeks from the time of order to receive the suit. Custom Kart Suits – At Incredibly Low Prices! Is your racing team lacking a cohesive, professional look? Are you trying to make your way through the ranks and need a suit that will get the attention of sponsors? Has your team recently received new sponsorship and you need new suits that incorporate their logos? If so, we can help. 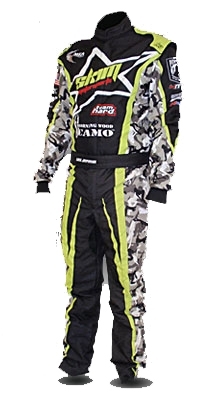 Our custom kart suits are affordable, durable, and comfortable, and they are made to the highest quality standards. These racing suits can be tailored to your exact specifications – whatever your needs, we have them met. We design our own race apparel and we are confident that you will not be disappointed. Whether you need five suits or 15, we'd be happy to help. Take a look for yourself. 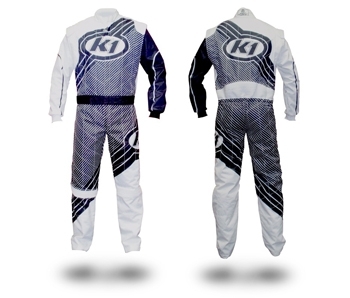 Our custom kart suits are CIK-FIA approved and made using double-layer Cordura® fabric. You even have the option of adding a black Coolmax® inner lining to your racing suit for added comfort and cooling – a K1 exclusive! The black Coolmax® lining hides dirt better while allowing your skin to breath for long-lasting comfort. If you've been karting long, you know the benefits offered by Coolmax® fabric – it can prove the difference between a win and an exhausting battle for last place. Finding a racing suit that features Cordura® and Coolmax® construction is easy, though. What truly separates our custom kart suits from your standard racing suits is the fact that we can design it around your needs and wants. After all, if all you're seeking is a Level 1 or Level 2 karting suit, we have those. For something truly original, you need to customize it, and we are happy to help at K1 Race Gear. With our own manufacturing facilities, we can control the fabrics that we use, choose our colors, and offer dye-sublimation, which is a process where the design is printed into the material rather than atop it. Utilizing this manufacturing method, we can achieve unmatched detail and color. The difference is apparent! Place Your Order – We're Here to Help! Our custom suits are made to order, with pricing starting as low as $395.00. You will not find another manufacturer that can come close to these prices for a full custom kart suit at such a high quality. Please download our custom template and custom measurement forms below. Once you have completed the templates, please email them to (858) 344-3832. If you wish, you may also choose a custom suit from our gallery and change the colors to fit your needs. As always, if you have any questions, we are more than happy to answer them. Customer service is important to us, and as racers ourselves, we understand your needs. Call to order your custom kart suit today and stand out from the crowd!